A lot of us work on computers for long periods of time. While browsing the internet, we might feel the need to take a break from work and leave our computer for a while. If we have many open browser tabs, then chances are they hold a lot of important data which we have worked on for a long time. Therefore we would not want anybody to disturb our browser in our absence. It will take a lot of time for our tabs to reopen and reload. Moreover, the data they contain might be irrecoverable. 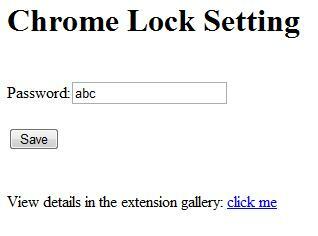 For users of the internet browser Google Chrome, there is a wonderful solution to this predicament and it comes with the name of Chrome Lock. ChromeLock is an extension for Google Chrome which helps you protect your open webpages from anybody who might access your computer. Installation of the extension is very easy (just click on the blue INSTALL button on the extension’s homepage) and so is its usage. If your Chrome is equipped with ChromeLock and you need to take a break, simply press “SHIFT+L” on your keyboard and your Chrome will be locked, signified by the lock icon in the bottom left. Locking a webpage means nobody will be able to change its URL. 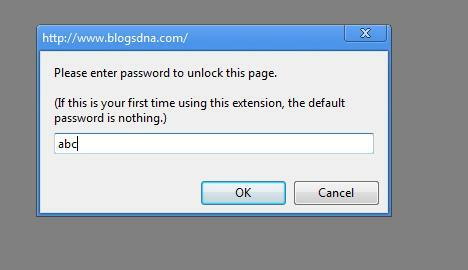 You can always set your own password by clicking Tools > Extensions >Chrome Lock Options. Unlocking is done via the same key configuration. All you have to do is click OK and enter your password which was initially entered by you in the settings. In conclusion, ChromeLock perfectly complements Google Chrome and is a wonderful security tool to ensure we do not lose our work.